Want an easy breakfast the whole family will enjoy? Easy overnight oats are the answer! Super simple, incredibly delicious and so good for you, too! OK! Not only am I serving up a DELICIOUS breakfast recipe today, but in addition…. 🥁🥁🥁(insert noise of a drum roll please!) 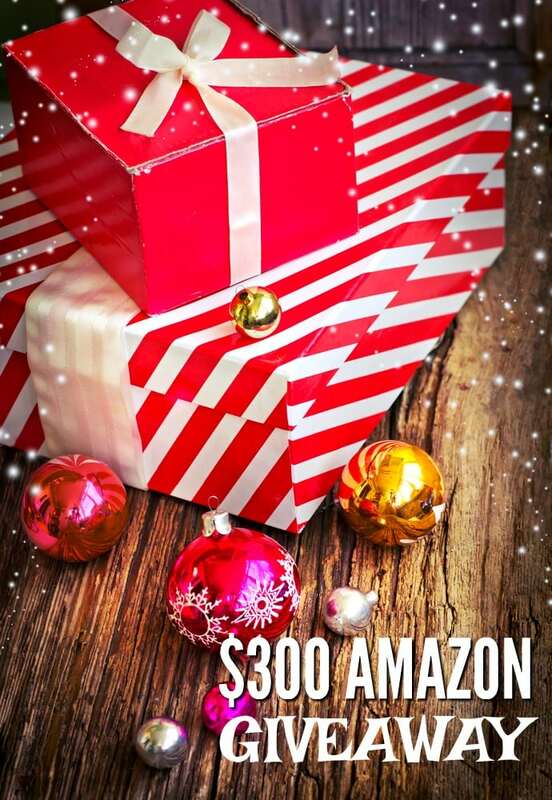 We have a $300 AMAZON GIFT CARD UP FOR GRABS! Yup, that’s right! A bunch of us got together, pooled our moolah and there’s a giveaway going on here! So if you want to skip all the fun stuff and head right down for the giveaway, just scroll to the bottom of the blog and make it happen! If not, stick with me for just a bit so I can show you how easy overnight oats are to make! Going to stick with me? Great! Let me ask you this; Are you a breakfast person? For the longest time, I could never eat breakfast food. I’m not sure why. Give me leftover pasta, sliced meat from the night before. Leftover lasagna, yes I was that person. Breakfast food never sounded good. Probably because I was usually eating alone. Now, Dan and I make a point of eating breakfast together and usually the evening meal too. It just makes it more fun when you’re enjoying a meal with someone rather than by yourself! Now I like to eat breakfast; Avocado Toast Breakfast Sandwich, a Papaya Breakfast Bowl or a stack of Pumpkin Pancakes, YUM! Honestly, I feel better since I’ve been more deliberate about mealtime and one of my go-to breakfast meals is overnight oatmeal. 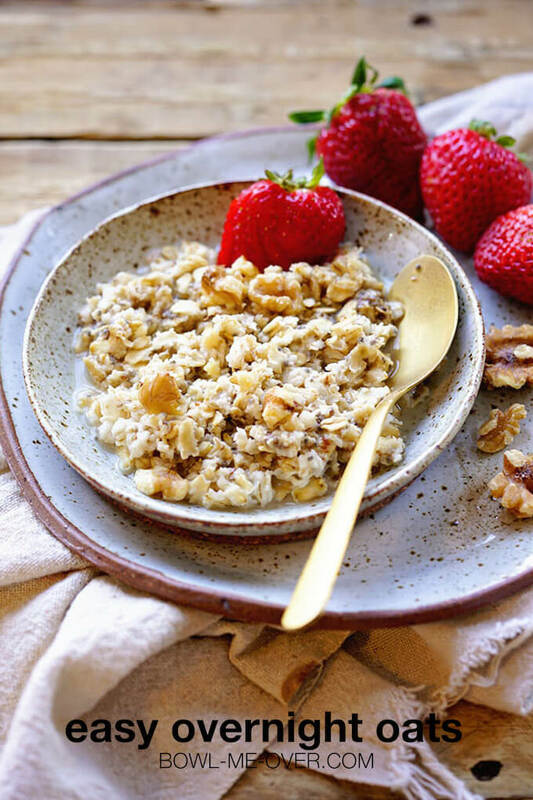 It’s an easy breakfast and everyone loves it – no boring oatmeal here! And if you’re like us when you’re dashing around and you’re all going different ways, making it ahead the night before is definitely the way to go! Easy Overnight Oats is a great way to start the day! Actually you can eat them either way. The trick is – you simply mix up the oatmeal the night before and tuck it in the fridge. The next day, enjoy! Heat it up, don’t heat it up – it’s totally up to you! Yes, this is a super healthy meal and what a great way to start the day! Oats are really good for you! A great source fiber, oats fill you up fast and longer and can help you loose weight! As a whole grain, oats can help you lower your risk for diabetes (and you know I’m always talking about that!) and also help reduce your cholesterol. A bowl of oatmeal is a balanced meal and contains lots of good nutrients, vitamins and minerals. 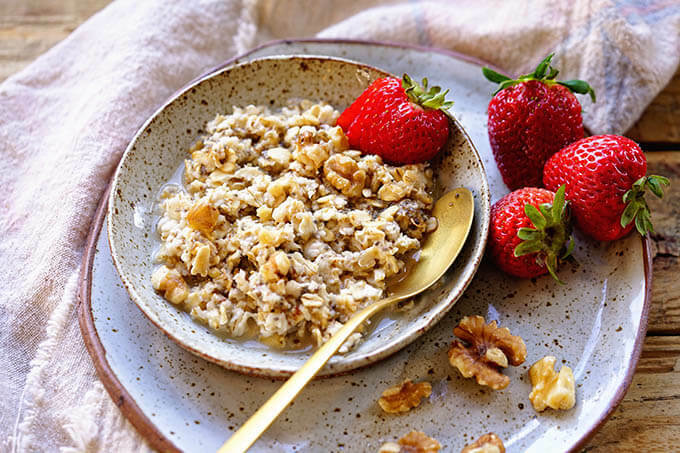 If the reasons above don’t convince you – then how about this… oatmeal is delicious! Easy overnight oats will last in the refrigerator up to five days. If you make them in small mason jars, you can even screw on the lid and tuck them into your purse or lunch bag. No need to skip breakfast now! What types of Oats are best for you? Here’s the deal – choose which ever oatmeal works best for you, your family and your budget! No judgement, right? If you can get a good, nutritious meal in your kids, hubby, best gal – whomever – before they hit the road in the morning, that’s what matters! Easy overnight oats are a simple delicious breakfast! This Overnight Oats Recipe can be a total brunch thing – cute and deliciously served in small jelly jars and easily stored in the refrigerator. You can make it ahead so that’s a definite plus! It’s also perfect for a weekday breakfast. Measure equal parts of Oatmeal and liquid – such as milk, nut milk or even yogurt. Pour it over the oatmeal. Cover it and refrigerate overnight. 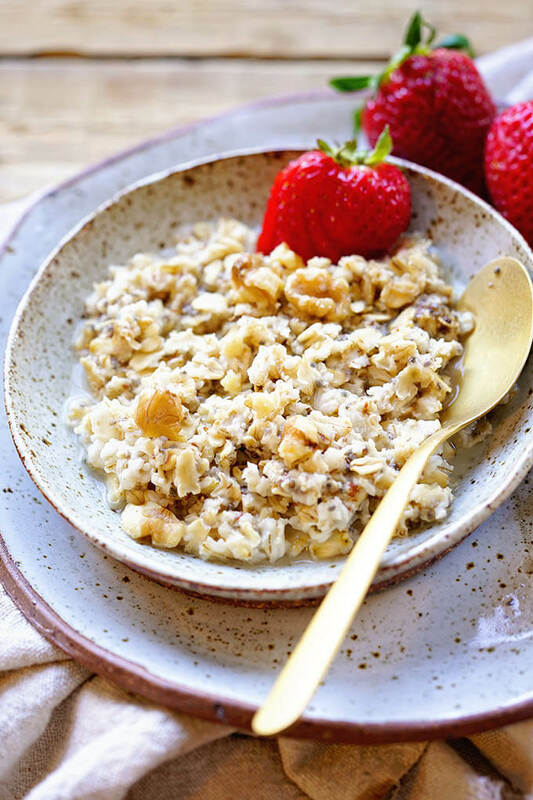 If you’re using steel cut oatmeal, increase the liquid by half – instead of 1 cup use 1 1/2 cups. In the morning, simply slice and chop your favorite fruit. Add granola, chopped nuts or a spoonful of chia seeds and serve. It’s really that easy! Top the oatmeal with ingredients you enjoy! This is a total “make it your way” type recipe! Don’t have strawberries? Use blueberries, sliced peaches or raspberries. Chia seeds not your thing? Chopped walnuts or pecans would be delicious. A spoonful of your favorite granola will add a nice crunch! Not into breakfast oatmeal? Then have a couple 3 ingredient Oatmeal cookies! They are perfect for breakfast, trust me! Don’t forget, before you go, scroll down and enter the giveaway! I’d love for one of my readers to win the $300 Amazon Gift Card! 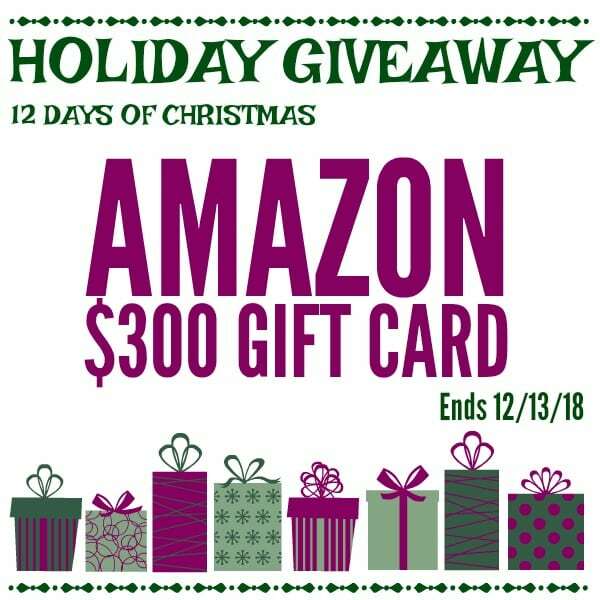 Welcome to the 12 Days of Christmas $300 Amazon Giveaway!!! Ha! I am totally the opposite Liza – I can accomplish a ton before 11am – after that… well I do my best! 🙂 Gotta love a recipe that is good and good for you too – enjoy Liza! Thank you so much for stopping by and taking the time to comment!! I didn’t think steel cut oats would soften up enough overnight to be edible. I mean, old fashioned, yes, but steel cut are the whole oat and chaff… do they really soak up the moisture? I’ve made this with old fashioned & steel cut – the texture is different with the steel cut Lisa, but they tasted great too. They soaked up everything so it’s really personal preference. Thank you so much for leaving a note! These look perfect for breakfast! I can’t wait to try this recipe! So yummy, enjoy Sara and thank you for stopping by! 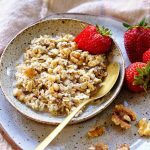 I love overnight oats 🙂 This looks so delicious– the drizzle of honey on top! Beautiful. Love the idea of jars Michelle, grab ‘n go always works in my house! Overnight oats are the perfect way to eat a quick breakfast and get out the door. I always used to make them in jars and grab one to eat when I got to work. Love it! I so agree Amanda! And making them in jars is the perfect grab ‘n go breakfast!! I’ve never tried this obviously seen it loads though, I generally prefer my porridge hot and warming, lovely flavours in the topping. Never know Brian, you might find out you really like overnight oats – I hope you give it a try! I love overnight oats since they’re so customizable and easy to make. It’s great waking up to breakfast already made. These look so Yummy! You know I think you really hit on it there – wake up to a beautiful breakfast! Best part, have a great day Stephanie!! I’ve been looking for a way to break out of my breakfast rut, and this sounds like a great place to start – especially with all the fresh summer fruits that are available or will be soon! Oh yes, what a great way to break up your routine – enjoy Mary! These really look wonderful! I <3 overnight oats! Thanks Kristen, enjoy and have a terrific day!! I love overnight oats! This looks wonderful! Thank you so much Marsha, I appreciate you stopping by!! i have never made overnight oats before but these bowls look just delicious! Add it to your routine Beth – so good and so good for you!! Drool worthy breakfast right there! I’ve still not tried overnight oats! I need to try this! I have yet to try this and every time I see this kind of recipe, it gives me a kick in the pants to be healthier. Thx for the push – now I need to follow through. It has to be good with the fruit and honey added. Good luck Peter! I know we all strive to be healthier and some things are easier than others. I hope you enjoy this recipe! I love the idea of doing the work the night before. I LOVE a grab and go option! Mornings are always such a crazy rush, being able to grab-n-go works for us too – thanks Dorothy! I’ve still not tried overnight oats, really must though may wait till it’s cooler as we’re in a hot spell here just now! I love how easy they are and pulling them outa the fridge on a busy morning makes them even yummier! Thanks Kavey! If I won, I would buy a new cat tree for my kitties. Oh how fun and what a GREAT treat for the kitties, love it Charissa!!! What an amazing an easy recipe! I always rush in the morning and this one is a life-savior! My daughter swears by steel-cut oats! Now, you’ve convinced me to try them!! Most definitely Patricia! It’s a wonderful breakfast, enjoy! I’d use the $300 Amazon gift card to buy my grandson gifts from Nat’l Geographic Kids. I would use the Amazon gift card for a TV. oooh how fun! Good luck Antionette! I will buy more presents for my family, including my 4 kids! How wonderful – Merry Christmas to you Megan and good luck in the giveaway! That looks like the perfect breakfast. Thank you Lewis, I love oat too! It’s a great way to start the day! !